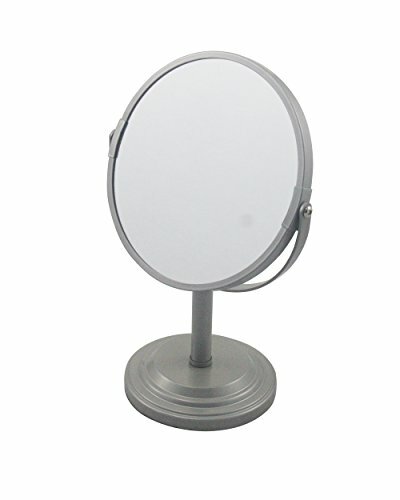 The LDR Bathroom Vanity double sided Pedestal mirror is the perfect combination of style and practicality. The mirror measures almost 6 ½ inches circumference for a full view and ease of usage. The mirror is fog resistant and has two views. One side is a regular view and the other is a 3X magnified view. Great for a up-close shave or applying makeup. The pedestal design makes it easily transported and can be quickly places and moved to where you need it. The base is weighted to ensure that the mirror stays stable when placed down. Metal construction which is coated in a matted chrome finish. The finish will resist chips cracks and rusting. Make it yours today! Quality Fog Resistant Mirror will give you a clear reflection for precisely applying your makeups as well as making sure your shave is looking perfect! Well Packed for Secure Shipping easily maintained transportable and easy to use Make it yours today!